Official details of Renault's upcoming Kwid have been revealed, ahead of its media drive tomorrow. The Kwid, will be launched in an extremely competitive and crowded sub-4 lakh entry-level hatchback segment. Although, the Kwid will compete with entry-level hatchbacks, it is designed to look more like a crossover. Seeing the overwhelming interest the Indian audience has shown towards small SUVs and standard hatches with increased height, Renault seems to have got it right with this design. The Kwid will be powered by a 799cc three-cylinder petrol motor good for 54bhp. It weighs only 660kg thanks to lightweight construction and all-aluminium engine. The Kwid delivers an impressive fuel economy figure of 25.17kpl. It is 3,679mm long, 1,579mm high, 1,471mm wide, and has a wheelbase measuring 2,422mm. It gets a class-leading 180mm of ground clearance which gives it the mini-SUV stance. Boot space is impressive at 300 litres, which will exceed most of its rivals. It will be priced between Rs 3 lakh to 4.5 lakh. Renault says it will have virtual showrooms for the Kwid. The Kwid will come with around 60 accessories for personalisation. Top-spec variant will come with a 7-inch touchscreen infotainment system with USB/aux and Bluetooth connectivity. It will come with a 2-year/50,000km warranty. 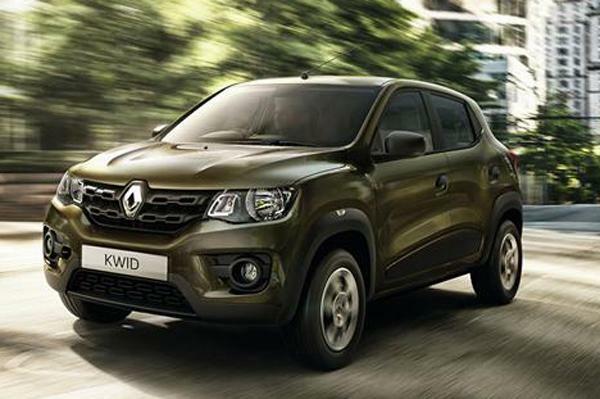 Renault is currently working on more sub-four-metre derivatives of the Kwid which could include a sedan, hatchback, a seven-seat model and a 4x4.